You are beginning one of life’s most exciting journeys—parenthood. Some days are as effortless as a day at the beach, and others are as challenging as hacking through uncharted jungle. Sometimes the rewards of parenting are obvious, and others are realized later. Along the way, discoveries about your baby and yourself make sure life with a little one is never dull. Let the baby bonding begin! 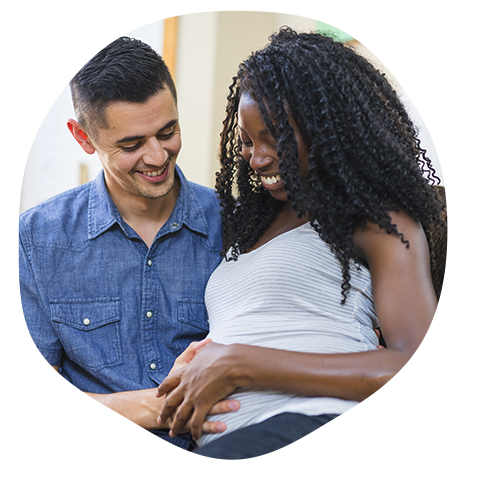 Understandably, many new and expectant parents worry about caring for their baby and understanding the baby’s needs. The early stages of life with your baby will go more smoothly if you let your baby be your tour guide. They will show you when they’re hungry, sleepy or needing comfort. When you respond promptly and with love, your baby learns that the world is a safe place and trusts you to be there to meet their needs. In turn, you will grow to trust your parenting ability as you learn to read your baby’s cues—both the obvious and the subtle. Feel their whole body relax when they are snuggled on your chest. Notice how they turn away when they have spent enough time looking at something. Listen to the smacking sounds they make when they are getting hungry. Watch your baby’s signals and their responses to your actions and learn as you go. The easiest way to think about interacting with your baby is that you are your baby’s favorite everything: Face, voice, food source, snoozing spot and more. It’s fun to think that before and after birth, you are your baby’s natural habitat! Even though some parents need a few days to feel connected to their baby, babies come to us already in love. They are ready for interaction and are deeply connected to their parents. So, take pride and delight in how soundly the baby sleeps on your chest and how your baby settles down in your arms after being fussy with a visitor. Since your baby has been listening to you talk and laugh for the last months of pregnancy, your voice is familiar and comforting. Indeed, no matter what your singing abilities, to them, yours is the sweetest of voices. Also, they know the rhythm of your body and may enjoy snuggling up to hear the symphony of breaths and heart beats. Hold your newborn close, and within days of birth, they will recognize your smell. They will be mesmerized by your face, which they will see clearly when breastfeeding or being cradled in your arms. Believe it or not, you know many ways to comfort them just by being you! When asked this question, most people respond with the obvious answers: Food, cleanliness, comfort, safety and sleep. Equally important are the emotional needs of babies. Just like us, they need to feel loved, secure and connected. Human babies are hard-wired to interact. This interaction takes on many forms: Enjoying moments of gazing into each other’s eyes, kissing their feet during a bath, holding them while dancing and singing along to your favorite music, reading out loud or playing peek-a-boo, just to name a few. Think of all of this loving interaction as food for your baby’s brain! Humans need this connection and stimulation just as they need food to survive. As long as you follow your baby’s cues, you can’t be too responsive or playful, so have fun. Crying is a part of life for human beings. Just like us, when babies cry, they are reaching out for help and comfort. This might be in response to hunger, a dirty diaper, loneliness or boredom. Whatever the reason, parents should respond to their baby’s cries promptly. Tuning in to your baby’s cues will help you to differentiate the cries, and sometimes help you to meet their needs before any crying even begins. Making sure your baby feels secure is one way to diminish crying. Many babies like to be swaddled, which likely reminds them of being snug inside during pregnancy. When babies cry vigorously, they tend to flail their arms and kick their legs. If your baby seems to stress during diaper changes, try gently holding their arms to their chest to simulate that snug feeling and help them settle down. When babies cry after a long day of overly stimulating visitors, they just need what we do after a difficult day at work: to feel comforted and heard. Unlike us, they can’t make a polite excuse to leave the room and take a break for a few minutes. This often leads to crankiness later. When you have checked your baby’s diaper and offered a feed to no avail, click into your knowledge about how to comfort people. Hold your baby close, take them to a quiet place where you can really focus, talk and listen. Babies often respond to compassion in our voices, so go ahead and say what you would to an upset friend. We don’t always understand why a baby is crying, but decreasing the stimuli (lowering the lights, turning off the TV or radio and speaking in a quiet voice while moving around slowly) often helps. You are your baby’s best and most important teacher and there is learning in every day. The opportunities for interaction are infinite, and you’ll likely find it easier to get more done. In life, it is rare for a day to be pure fun; family and work responsibilities are ever present. It’s great for children to gain this understanding early and learn to find the joy in every day, even if it is just laundry day! Apart from a few essentials, your baby doesn’t require much in terms of equipment. When choosing baby gear, stick to the items that foster your closeness and engagement. Because everything is new and interesting to them, don’t worry about creating a stimulating environment. Including them in your activities, educate them through exposure to different sights, sounds and smells. Wearing your baby in a sling or front carrier is especially entertaining because they can see from an adult’s vantage point. As you move throughout the days, tell them what you are doing and thinking. At around three months of age, your baby will babble back at you. Pause for their reply after speaking and you will be helping them to learn the rhythm of conversation. As they discover their voices, they will delight in the variety of squeals, growls, and coo, especially if you mimic the sounds back. Our babies offer us a second chance to discover the joys found in simple things: blowing bubbles, splashing in the tub, walking barefoot. Many parents are thrilled to re-read their favorite childhood books and sing long forgotten rhymes and songs. Allow yourself to be guided by your baby and trust that they will give you the cues you need to take great care of them. Above all, remember to enjoy your baby. The one guarantee we have as parents is that our babies will grow too fast!